Washington (CNN) - Here's one indicator of Marco Rubio's star power: the Florida Republican Senate candidate has not even won his election, but he's already heading to a key state in the presidential nominating process. Rubio will join Sen. Jim DeMint, one of his political patrons, for a three-city tour of South Carolina on March 15 to "promote common sense ideas and new conservative leadership," a GOP source in the state told CNN Monday. DeMint aides will also launch a new Web site - DeMintRubio.com - to promote the tour starting Tuesday. DeMint broke with his GOP colleagues in the Senate last summer to endorse Rubio in his GOP primary battle against Gov. Charlie Crist. The conservative senator also introduced Rubio before the rising star's speech last Thursday to the Conservative Political Action Conference. The trip is being promoted through "Friends of DeMint and Rubio," a joint fundraising committee established on behalf of DeMint's 2010 re-election bid and Rubio's campaign. The two Republicans will visit Charleston, Columbia and Greenville, a swing that will give Rubio a chance to meet activists and key political players in the state, which has voted for the eventual Republican presidential nominee in every primary contest going back to 1980. UPDATE: The Crist campaign was quick to pounce on the news of Rubio's out-of-state foray. "It’s disappointing that Speaker Rubio’s new found fame would lead him to so quickly forget Floridians. Slowly but surely, we are seeing more of who the real Marco Rubio is – someone who routinely puts politics and political aspirations (and in this case South Carolina) above the people." The Supreme Court's decision to allow corprations to contribute as individuals is already panning out for the repuplicans. This is why it is imperative that a democrat gets elected as POTUS...the Court's appointments are as important to politics as oxygen is to life!!!!! I have never seen the word "activist" used so many times in article about Republicans as I have from CNN in the past week. What are you trying to say, CNN? Like Rubio, I too am a Cuban-American child born to Cuban refugees fleeing communism. However, I support Obama, and I back some sort of universal healthcare program. Not because I am socialist or communist, but because I believe all Americans deserve to be taken care of when they are sick. Rubio argues that Obama has communist leanings, and he caters to the older Cubans who are still holding a grudge after the Bay of Pigs and Elian Gonzalez. Rubio should know that Obama is not Fidel and that Republicans have done nothing but use the Cuban vote by spouting the anti-Fidel one liners. Hows that nonunion made Toyota workin for ya? Hahaha,you may not get the welcome your looking for there Rubio.He wishes he were president of Cuba and Florida. South Carolina–first to secede from the United States in 1861, and home of traitors and extremists like John C. Calhoun, Preston Brooks, Joe Wilson, and Jim DeMint. Perfect place for Rubio! Maybe if we're lucky, the state will secede again, taking all of the Tea Party, anti-American wing-nuts with them–especially Palin, Bachman, Beck, and Limbaugh. Rubio is running a victory lap before the votes have been cast. Running for president while he is a state legislature, sounds like he is pulling an Obama. Counting your chickens before they are hatched is the most arrogant thing a far-right social conservative politician can do. We have found the real of 'Axis of Evil'–and it is these two clowns. I trust the voters of Florida to see thru these two unamerican losers. DeMint is the same man who visited illegitimate foreign governments as an afront to his own government and hopes to see America fail. Rubio is a fraud as a politician who the exact opposite of what we need in our government. "Three city tour of South Carolina"............Whats DeMints plan? Is he gonna show him what dumb people look like and where they live?! IMO, rubio looks like he isn't very intelligent. I'd be willing to wager he wouldn't score over 100. I've often wondered if his jaw is wired shut so it doesn't slack on him, not that it really matters to his mouth breathing supporters – the teabaggers still would vote for him if he walked up to the podium and drooled for five minutes without uttering a word – cause it would **** off the democrats! IQ tests should be mandatory prior running for public office, and they should be performed in public. If a potential candidate scores less than 130, they're done. I wouldn't rule out Charlie Crist yet. He did the right thing and is not the hypocrite that other Republicans have been. He did what he believed what was right for his constituents. I'll take that over this "conservative" witch hunt. The majority are not that conservative, they are just angry. He's going there (like all the rest do) to get his feet washed by Jesus DeMint and be purified. Dumb people in SC have helped ruin this entire country. No reason to stop now. DeMint is the best the Republicans have to offer? "Common sense ideas" are foreign to DeMint. 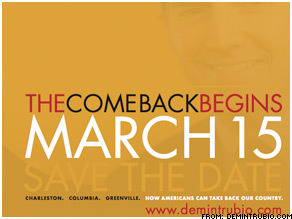 It is hilarious that a loser like DeMint puts such a slogan to his campaign. Poor Rubio is attaching himself to a gas bag with a big leak. Anxious aren't YOU?? It would be something if your BEHIND get beat by Crist!!! SC is a RED STATE!!!! They both would get a good reception there!! !